My memoir, by definition, is my perspective. Since it was published, I have received some great e-mails from readers, friends, and colleagues who wish to share their insight into the events that I wrote about. It is with honor that I share these additional reflections from the men and women who have laughed and struggled, soared and grieved, and stood along side me or at least crossed paths during my aviation career. A little more to the story: The King Air was actually donated to us. Enroute it lost complete electrical, so the pilot, Rob Paulus, spiraled down through a hole in the undercast to land in Penn Yan, NY. Seneca Foods was based there, and they fortunately also had a King Air. Their mechanic generously swapped out the needed electrical component from their airplane, and on we went to land in Batavia. I delivered the eulogy, reading a poem written by the wife of Sam Brunetto, one of our captains. It was called “The Captain’s Hat”, which was allegedly found floating in the ocean. We had a captain’s hat sitting on a pedestal, but just out of my sight. As I spoke to several hundred people, broadcast on live TV, the crowd gasped. After finishing, I sat down next to Jim Corley, one of our captains, who said “you think you did pretty well, don’t you?”, and I of course smiled approvingly. “Check out the hat.” Unknown to me, the crowd was not gasping at my fabulous speech; they were in disbelief as the hat simultaneously slipped off the pedestal, catching itself by the brim at the last second! So much for my ho-hum performance. After an arduous day, off we went to the airport for our return flight. While flying down the Hudson River late at night, the King Air again had a complete electrical failure. I called TWA’s Operational Control on a cell phone, they relayed our call to air traffic control, and that is how we completed our approach and landing. Good luck always trumps skill! When I was hired at TWA, I had years under my belt of training air carrier pilots in simulators. I could create realistic emergencies using carefully thought out plans of action. I methodically studied the FAA’s Air Traffic Control Order so I could emulate controller phraseology and vectoring techniques. My fingers flew across the touch screens at instructor stations on new simulators, or the mechanical pushbuttons on older devices, like a virtuoso playing a Steinway. Or so I imagined, anyway. As Austin Powers might say, I fancied that sort of thing was my bag, baby. So I was happy when, before I even finished B-727 flight engineer new-hire ground school at TWA, they asked me if I’d be interested in becoming a flight engineer (F/E) instructor. “I’m in!” I said. While at the TWA training facility at JFK’s Hangar 12, where they sent me for F/E flight training, I was jumping for the F/E instructor station in the B-727 simulator every time the poor guy left it unoccupied. I was more interested in that instructor station than in the engineer’s panel I was supposed to be paying attention to. But no, they were sure that’s what they wanted me to do. So I agreed to become a B-727 F/E line instructor pilot/line standards pilot or “LIP/LSP” (pronounced “LIP LISP,” as though it were some kind of congenital mouth deformity). Otherwise known, I soon learned, as a “445,” derived from the ancient, Constellation-era payroll code for pilot check airmen, which was “890.” The theory was, apparently, that I was about half of a real check airman. I consoled myself with the thought that this had to be a step up from garden-variety flight engineers who probably counted as “222s,” or something. Anyway, it turned out, to my surprise, that I really enjoyed instructing and evaluating flight engineers on the line. (LIPping and LISPing, you might say). They sent me a steady stream of new-hires at first, giving way after a while to mostly line checks for not-so-new guys and ROPEs. (Which stands for Real Old Pilot Engineers, the slightly unfriendly term for over-60 pilots who, too old to serve as pilots, elected to, rather than retire, soldier on as flight engineers. I use the term here with respect). The job also provided opportunities to mingle with ’96-hire flight attendants, especially when I had a good student and could leave him or her unattended at the panel for a few minutes while I stepped back to discuss plans for the evening’s activities. The new hires, fresh from their checkrides, knew their emergency procedures cold, for the most part. They didn’t need any more training in that area. I worked with them, instead, on techniques for smooth and efficient operation of systems: showing them, for example, how to caress the 1960s-era pneumatic outflow valve controls in order to get through the day without bumping anyone’s ears. The advanced art of 727 temperature control was for graduate level F/E students. After the flight, I’d have them ask the flight attendants “How was the temperature?” If the answer was a bored look and a “Hmm, I didn’t really notice it,” the student would earn a grin and a thumbs up, and I’d be on the hook for the first round of post-trip beers. I also enjoyed being a 445 because it let me control my schedule better than any lineholder, plus the extra pay put me ahead of my classmates who had upgraded to first officer at the first opportunity. Working fifteen days a month, making decent money in my first year…I wasn’t willingly going anywhere, especially not to the right seat of a DC-9 or even the B-727, where I wouldn’t have had nearly such a good view from which to judge the quality of the cabin service. If you get my drift. Here’s where the story gets funny: I never could get any seniority because of the constant flowback of ROPEs, all of whom were obviously senior to me. In fact, the longer I stayed, the more junior I got, especially once the 727 fleet started its drawdown. But I never cared; it didn’t affect my schedule as long as I could continue LSPing along and arranging my own schedule of checkrides to conduct. Life was still good. Then one day, boom! I couldn’t believe it—I’d been displaced. Right off the bottom of the STL B-727 F/E list, and into a middling-seniority B-767 first officer position. 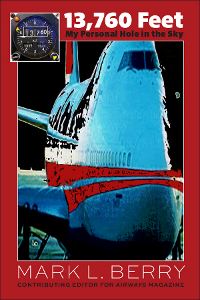 I might be the only person in the history of TWA to be displaced from B-727 flight engineer to B-767 first officer. So, kicking and screaming (figuratively, anyway), I was dragged away from my warm, softly backlit flight engineer panel, swiveling seat, and junior flight attendants to the B-767, which is where I stayed for most of the rest of my time at TWA. I still remember becoming convinced in B-767 ground school that all the odd things about that airplane, systems-wise, were the direct result of designing an airplane with one engine less than the correct number. But that’s a story for another time.